The relationship between an hobbyist and his models, is a special thing. Your miniatures can develop personalities and characters over the course of several games. This tank, for some reason, is exceptionally hard to kill, that unit, for some reason, always seems to die right away, and so on. These oddities allow us to create stories for our little men and strengthen the bond between us (the relationship, not superglue...). The more real we make them, the more fun it is to let our imagination run wild. We are, after all, pretending little pieces of plastic on a table are vast armies clashing in epic battles on distant and alien planets! Naming crisis suits based on their weapon loadout has been around for some time. The method of naming them was derived from a White Dwarf (the exact number escapes me) that described several Crisis Team configurations based on popularity and their Sept's tactical tendancies. The naming gave crisis suits depth of character, created a secret language amongst Tau players, and was downright fun to boot. 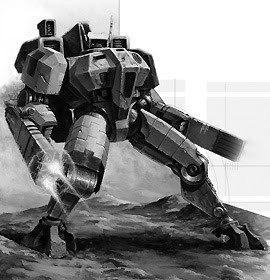 With our new codex and FAQ, the Tau crisis suit has more options than before, despite having no new weapons available. The changes to configuration possibilities needed to be incorporated into the existing system for naming XV-8's. ATT is updating their naming system and here is how they've done it. Keep in mind, that nobody is forcing you to use this particular system, or any system for that matter. This system is simply the least amount of change from the old one. Enjoy! There are seven weapons which XV8 Crisis suits are named after. Two of them are special issue/experimental weapons and so can only be taken once (and not twin-linked). The others can be taken as many times as needed; bearing in mind that only two weapons can fire per turn and the average XV8 has a maximum capacity of three weapons. The first word is the name that the weapon corresponds to for mixed weapon suits, and XV8s that only possess one weapon. The second word is the name that the weapon corresponds to if the weapon is the only type possessed and is either twin-linked, doubled or a mixture of the two. The number at the end is the weapon’s strength value and is used to denote when a weapon is twin-linked or doubled. Note: the CIB and AFP can be doubled but not twin-linked. Currently there is no method for naming a suit with two of these weapons and a third weapon. In these cases, you are free to come up with whatever name you choose! Often two different weapons will be taken together. These suits' names will be a combination of the names for both weapons. The list in the Introduction is also in a specific order. For a Crisis Suit equipped with a Missile Pod and a Burst Cannon, the Pod is listed before the Cannon. As such, the name would be ‘Firestorm’. However, if you were to switch the Burst Cannon out for a Flamer, then the order would change, making the name ‘Soulfire’. If twin-Linking a particular weapon, then add ‘-#’ after the name, with # being the number next to the weapon you want twin-linked. For example, a ‘Fireknife’ with a twin-linked Plasma Rifle would be ‘Fireknife-6’. If a Shas’O wanted to twin-link both weapons, then the number after the name would simply use both numbers, as in ‘Fireknife-67’, with the smallest number first. For various configurations, there are different names to those provided from the list of words in the Introduction. For all of these names, the last one is the most popularly used but it mainly comes down to personal preference. If the XV8 only has a single weapon, then it uses the first word from the Introduction list for the corresponding weapon, with the word ‘-suit’ at the end. For example, an XV8 with a single Fusion Blaster would be a ‘Forgesuit’, and an XV8 with a single Flamer would be a ‘Soulsuit’. There are also Crisis suits that only equip one type of weapon, but take multiples of this weapon; twin-linked, doubled or both. These XV8s use the second word from the Introduction list to signify a battlesuit with a single type of weapon that is twin-linked. To apply further distinction, you can add the weapon's number '-#' to the end of the name, showing that the weapon is indeed twin-linked, such as 'Cloudburst-5' or 'Sunforge-8' but this is not necessary. If you take two of the same weapon (rather than twin-linked, as above), add a ‘-D’ to the end of the name instead of the number, such as ‘Deathrain-D’. If you want to take two weapons AND twin-link one of them, then add a the weapon number at the end, such as ‘Deathrain-D7'. If a Shas’O wants to take two of the same weapon and twin-link BOTH of them, add a ‘-X’ to the end of the name, like ‘Deathrain-X’. Standard practice is to use the names from the Introduction in the order given. For example, an XV8 with a Flamer, Burst Cannon and Missile Pod would be called a 'Soulfirestorm', or 'Soulfirestorm-5' if the Burst Cannon was twin-linked. It is also possible to have no weapons at all on an XV8. In this case, the battlesuit is called a 'Supportsuit', although some call it a 'Commsuit'. A particular loadout where a Shas'vre possesses both a Multi-Spectrum Sensor Suite and a Command and Control Node, is called a 'Raven'. A Shas'O with both the Multi-Spectrum Sensor Suite and Command and Control Node, is instead called a 'Kingfisher'. Helios: Plasma Rifle + Fusion Blaster. Thunderstorm-5: Airbusting Fragmentation Projection + Twin-linked Burst Cannon. Soulknife-D6: Two Plasma Rifles + Flamer. Sunforge-D8: Fusion Blaster + Twin-linked Fusion Blaster. Fireforge-8D7: Two Missile Pods + Twin-linked Fusion Blaster. Fireforge-D78: Two Missile Pods + Two Fusion Blasters. Fireforge-78: Twin-linked Missile Pods + Twin-linked Fusion Blasters. Cloudburst-X: Two Twin-linked Burst Cannons. The reason the systems will not receive their own names, is because they would increase the naming combinations by too much, making the naming system impractical and unweildy. Since all of the support systems have unique acronyms, that seems to be the way to go. An ATS cannot be anything other than an advanced targeting system. A VT must be a Velocity Tracker. So if you want to let people know what support system your suit is carrying, just use the acronym and they should understand. Again, this is only a suggested naming system. You can name your suits however you please. But it can be fun to be apart of a group that has a uniform system for naming its unit configurations. Plus, if and when I post my tournament lists up here, I'll be using this system to describe my XV-8's. I hope this guide is clear enough! Special thanks to the ATT community and Harlequin2 for developing this updated system. Edited for the 7th edition codex changes. Changes are in Blue and are not canon in the same way that the original naming system is.